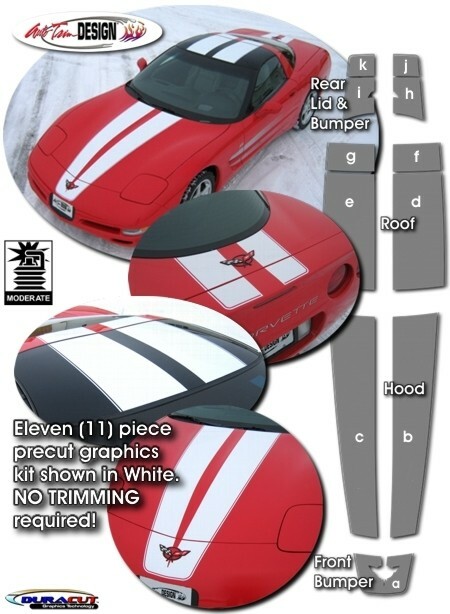 Make your '97-'04 Chevrolet Corvette C5 Coupe, Convertible or Z06 "Tough-looking" with this Bumper, Hood, Roof and Rear Deck Lid Rally Stripe Graphics kit. Coupe (shown) & Z06 kits come with eleven (11) pieces while the convertible is provided with nine (9) pieces. They're PRECUT and ready to install in a wide variety of colors - there is NO TRIMMING required! Trimmable Spoiler Kit #ATD-CHVCRVTGRPH109 consists of two (2) 16" (40.64cm) long pieces that can be trimmed during installation for custom spoiler applications.